For most people, the keyboard is the main way to enter information into and control their computer. But are you controlling your keyboard, or is your keyboard controlling you? If you make typing mistakes or find your keyboard a bit uncomfortable, it’s not hard to correct those problems. Here’s how to quickly and easily change your keyboard settings and comfort options. Even if you’ve been using a PC for a long time, there may be features on your keyboard you don’t know about. Take a moment to get to know your keyboard so you can be more efficient when you're working. The rate at which the mouse pointer blinks, which can help its visibility. The speed at which keyboard characters repeat, which helps you to avoid typing errorrs. How long you need to press a key before the keyboard character starts repeating. Even if you're a whiz with the mouse for Windows 7, Windows Vista or Windows XP, keyboard shortcuts are typically a more efficient way to work. 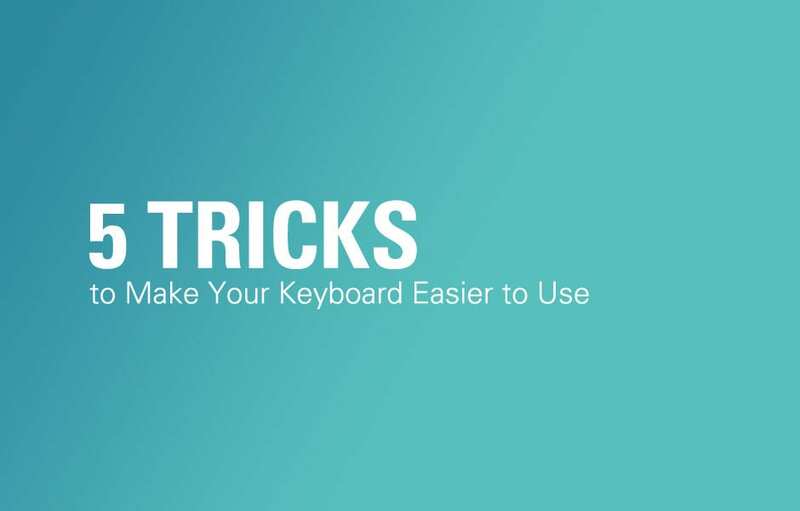 They're called shortcuts because they reduce multiple clicks into one quick press of keys, like hitting a chord on a piano. Getting to know a few keyboard shortcuts for the things you do all the time, like saving or closing files, can make using your PC much easier and faster. Here are just a few popular keyboard shortcuts: ALT+TAB Switch between open programs or windows CTRL+S Save the current file or document (works in most programs) CTRL+Z Undo an action CTRL+C Copy the selected item Windows logo key +F1 Display Windows Help and Support ESC Cancel the current task Application key Open a menu of commands related to a selection in a program. Equivalent to right-clicking the selection. For more, see the detailed list of keyboard shortcuts for Windows Vista, or Windows XP. Note: shortcuts for Windows 7 are the same as those listed for Windows Vista. Place your keyboard at elbow level, with your upper arms relaxed at your sides. Center your keyboard in front of you. If your keyboard has a numeric keypad, you can use the spacebar as the centering point. When you're not typing, relax your arms and hands. While typing, use a light touch and keep your wrists straight. Take short breaks every 15 to 20 minutes. Type with your hands and wrists floating above the keyboard, so that you can use your whole arm to reach for distant keys instead of stretching your fingers. Avoid resting your palms or wrists on any type of surface while typing. If your keyboard has a palm rest, use it only during breaks from typing. We have a great technology newsletter. Check it out.